On May 26th 1996, the Network SouthCentral franchise was awarded to Connex Rail Limited, the international transport services division of the multinational French company Veolia Environnement S.A. (also known as Vivendi between 2000 and 2003), which held activities in service and utility areas traditionally managed by public authorities, namely water supply, waste management, energy and transport services. The Epsom Downs branch thus entered a new era, namely that of full privatisation. According to the franchise agreement, what now became Connex South Central (CSC) was to last for a period of 7 years. The end of this phase of the branch's history would, however, come sooner - after failing to secure the franchise for a second term, Connex reached an agreement with its successful competitor South Central Trains (GoVia) to terminate its operations in 2001, two years ahead of schedule. Simply put, the 5 year Connex era was a disastrous time for the Epsom Downs branch. 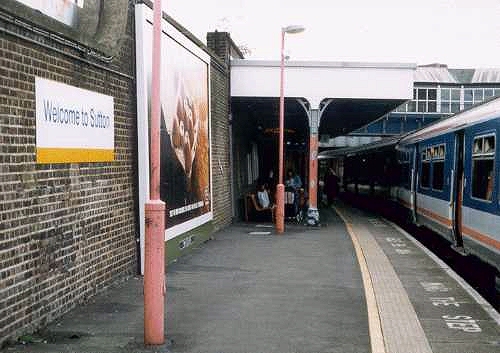 Whilst CSC management was tackling the refurbishment of Sutton station (a project which kept being delayed at various stages and made sure that Connex got a series of severe beatings from the public, Sutton Council, and the local MP), the rest of the line seemed to fall into oblivion. The result was a degree of neglect the line had not seen before, most of all at Belmont and Banstead, where the growing amount of vandalism at remote stations was met by a complete lack of policy, determination and action on behalf of Connex. The state of Banstead station during most of the Connex period illustrates the increasingly depressive general atmosphere which set in throughout the Connex years - and which virtually bordered on dereliction. The picture left (below) shows the covered stairway leading down to the platform in July 1999: It is some three years into the Connex South Central era, and things are at their worst. Just how much the place had been allowed to deteriorate in just a few years becomes evident when looking at the same view in 1990 during the Network SouthEast period (center). When Connex finally remembered the branch in August 2000, it was a case of far too little too late. While CSC did improve matters by getting out some paint and cutting back shrubbery - which had grown up like a jungle for years - this would be a superficial and temporary improvement only as the underlying problems were not tackled at all. It is hard to believe that Connex failed to see that creating a positive environment for its potential customers was a bare necessity for profitable operations. The way the branch was handled really only left the conclusion that Connex was simply hoping for approval to let it go at some stage - run down beyond recovery. But then something extraordinary happened on October 24th 2000 - Connex South Central became the first train operator to face the loss of its franchise - originally due to run until 2003 - after pronounced criticism of its management and performance. According to the Shadow Strategic Rail Authority (SSRA) it was the overall financial management of the franchise which resulted in its decision. In other words: Connex South Central had not delivered a service worth the £300 million of taxpayers' subsidies the company had received between 1996 and 2001. By the time Connex lost its franchise, the company only had the dubious distinction of having been labelled the "best hated train company in Britain" by the BBC. This was no surprise to its passengers, who were left stranded far too often (Connex was fined £1.2m in 1999 for running trains with too few carriages), nor in fact to its employees who had seen protracted industrial relations problems and a string of legal cases regarding breaches of employment law - which Connex lost. The feelings of many rail customers were thus summed up by a Member of the European Parliament for the South East, who publicly stated: "Good riddance! Connex South Central have provided a lousy, deteriorating service to rail travellers in this area. Their punctuality record has made the sloth look like an Olympic sprinter, and their under-investment has made a ride on their trains like an unscheduled visit to a railway museum." For the Epsom Downs branch, the demise of Connex was a reprieve, and not just the relief it was to so many passengers on the South Central franchise - it is hard to imagine how the line could have survived the policy of neglect that was forced upon it by Connex much longer. Once the franchise was lost, CSC did manage to improve the general atmosphere after all, ready for the handover to South Central Trains. This seemed somewhat absurd (such as not bothering to brand Banstead a Connex station until after the loss of the franchise), but it is to be assumed that Connex was not trying to win back favours from the customers they had mistreated so badly before bowing out. It is far more likely that CSC was investing in a little facelift only to raise the estimated value of the assets it was going to hand over to GoVia as part of the agreement for a premature change of franchise holder. The fact that Connex cared next to nothing about the branch was reflected in the late arrival ofthe CSC corporate identity of yellow, blue and white - Sutton lost its NSE guise as late as early autumn 1997, virtually 18 months into the franchise. Motive power in Connex livery was equally slow to make it onto the branch, and the white and yellow colour scheme didn't become a regular sight until the last phase of the Connex franchise. Almost a reminder of just how dismal the Connex era on the Epsom Downs branch had been was sent out by the Strategic Rail Authority on June 26th 2003 as it also stripped Connex of its South Eastern franchise at short notice, even though this meant the SRA had to take control of the franchise itself - which put a government body in charge of train operations for the first time since the railways were privatised. Once again, the Epsom Downs branch had survived, and this time by struggling through what must rank as the worst five years in the history of the line. Text, pictures and illustrations which are not labelled specifically are (c) Adrian Wymann and may be used freely for non-commercial use, provided that the source is indicated clearly. In all other cases the copyright holder is indicated, and this material may only be used with prior consent of the copyright holder.